The SAINT-DNA transfection reagent is a proprietary, non-toxic formulation of fully synthetic cationic and neutral lipids that forms positively charged complexes with DNA and enables highly efficient uptake of DNA into cells. 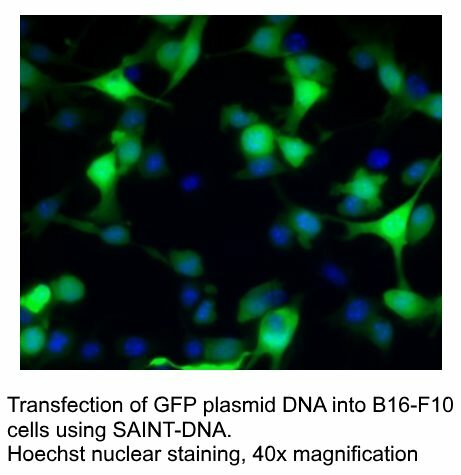 A wide variety of mammalian cells can be transfected with SAINT-DNA, some cell lines with efficiencies up to 100%. The transfection procedure using SAINT-DNA is easy: just mix the reagent with your DNA, incubate and pipette the complexes onto your cells. SAINT-DNA transfection reagent (1 ml) is sufficient for up to 200 transfections in 24-well plates or up to 1000 transfections in 96-well plates. 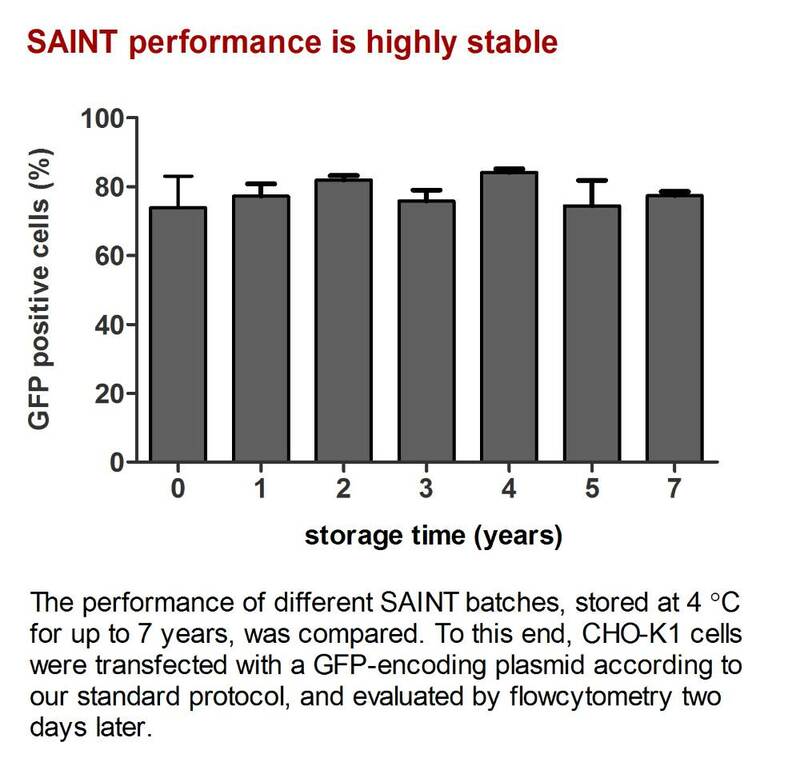 SAINT-DNA, stored at 4°-7°C, is stable for at least one year after opening. SAINT-DNA is an optimised version of SAINT-MIX, which has been used in many studies (see below for examples). 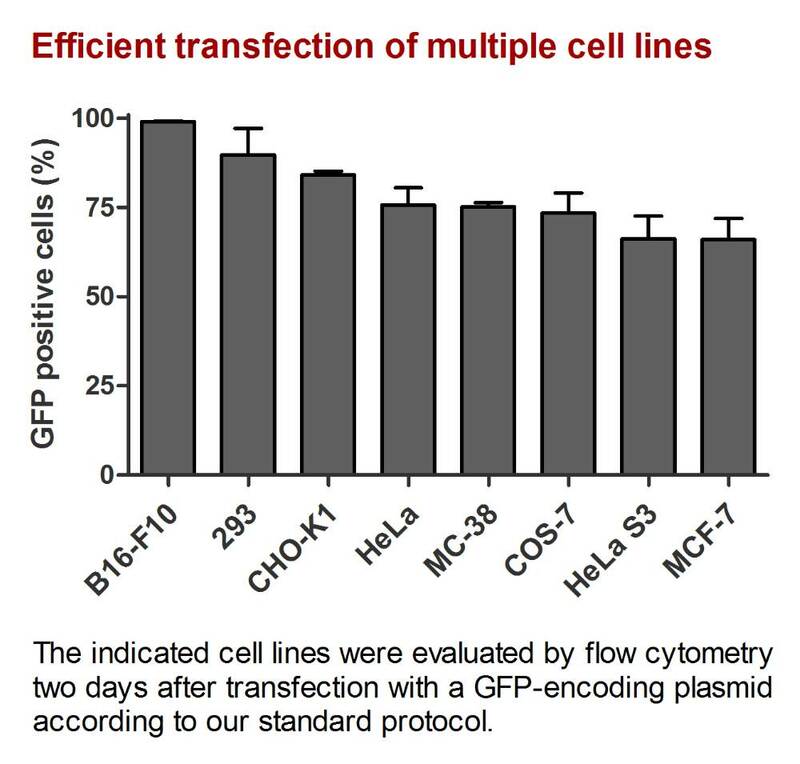 For a more complete overview of the cell types successfully transfected with SAINT-DNA, please visit our cell line database. Derfoul A, et al. “Glucocorticoids promote chondrogenic differentiation of adult human mesenchymal stem cells by enhancing expression of cartilage extracellular matrix genes.” Stem Cells 24 (2006): 1487-1495.
van Zanten J, et al. “A nonviral carrier for targeted gene delivery to tumor cells.” Cancer Gene Ther. 11 (2004): 156-164. Hou L, et al. “The prolactin receptor mediates HOXA1-stimulated oncogenicity in mammary carcinoma cells.” Int. J. Oncol. 41 (2012): 2285-2295. The SAINT transfection reagents can be produced compliant to current Good Manufacturing Practice (GMP). For more information click here.